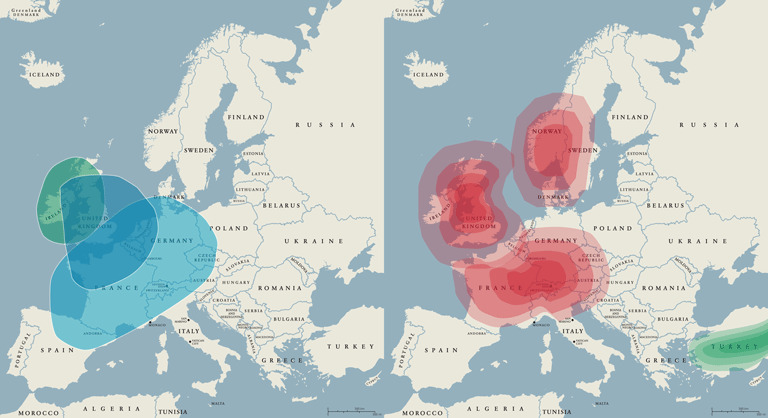 The author's DNA test results from AncestryDNA, left, and FamilyTreeDNA, right, vary significantly. If you’re like me, you can’t turn on the TV these days without seeing a commercial from a DNA-testing company encouraging you to discover your ethnic origins. In one of these ads, the test subject learns that she’s fourteen per cent Italian, a “fact” hitherto unknown to everyone in her family. Her brother Steve, she decrees, will henceforth be called Stefano. Cute, but the sad reality is that Stefano might well learn that he should be Esteban or Szczepan if he were to take the same test himself. As genetic genealogy (hereafter "gen-gen") authority Roberta Estes says, "These tests are great at detecting ancestry over twenty‐five per cent – but if you know who your grandparents are, you already have that information ... Intra-continental results, meaning within Europe, for example, are speculative, at best." Let’s think about it. What exactly is an Italian genetic profile? (You can and should ask the same question about any other nationality of interest.) The ancient pre-Roman tribes of the Italian peninsula had various genetic origins. Since antiquity there have been many peoples who’ve left their genetic markers — Greeks, Carthaginians, slaves from across the Roman Empire, the various barbarian invaders, the Lombards (another Germanic people), Normans (a.k.a. Vikings), Aragonese, and the French, to name just a few. In more modern times, we’ve seen Albanians, sub- Saharan Africans, and now Syrians. So when a test identifies someone as having Italian origins, does that mean a genetic profile similar to those who lived in the Italian peninsula fifty years ago? Five hundred years ago? In antiquity? Even if we could answer this question, no one is traipsing around Italy (or any other country) compiling massive databases of DNA extracted from bones dated to specific historical periods. At best the benchmarks for DNA-test comparisons may incorporate a few small-scale academic studies, but they are mostly derived from the self-reported origins of current populations — people just like you taking tests just like yours to discover their ethnic origins. What’s wrong with this picture? No wonder another gen-gen authority, Judy G. Russell, dismisses such estimates as "cocktail party conversation." Take a look at the accompanying graphics that show my purported ethnicity according to two different tests. Lots of fun, but they can’t both be right. Here’s the shame: Ethnicity estimates are the incidental by-product of autosomal DNA testing, which is the real deal — a truly revolutionary tool for identifying specific individuals with whom you share substantial segments of DNA. Yet these breakthroughs require analysis, time, trial and error — in short, a lot of hard work. In the easy-peasy world of genealogical advertising, that’s the inconvenient truth no one dares mention. It’s much more expedient to promulgate nonsense with an aura of truthiness. Of course in genealogy there are always exceptions. One well-known researcher points out that a distinct, substantial, and unexpected finding of ethnic origin can help to focus the research effort of an adoptee who knows nothing about one parent. That’s probably not you. Test at your peril with organizations outside the three major companies serving the gen-gen market: AncestryDNA, FamilyTreeDNA, and 23andMe. Be wary of similar-sounding names, especially those using the word “Ancestry”; you’ll get a vastly inferior test. Warning: such tests have been known to pop up on online coupon sites. If you must test for ethnic origins, experts agree that 23andMe may be marginally more accurate, although there’s not much in it. AncestryDNA and FamilyTreeDNA have their own autosomaltesting strengths that may well be more relevant to you. If you want to make a contribution to the scientific understanding of genetics, migration, and human history, participate in the National Geographic Genographic Project. This study uses different technology: specific DNA types that are passed whole from generation to generation without admixture, thus helping scientists to map certain large-scale migrations over time. This article originally appeared in the October-November 2016 issue of Canada’s History magazine.